After enjoying his first Premier League start just last weekend, Nigerian forward Isaac Success could be watching from thestands this weekend as Watford take on Swansea City. The Hornets splashed out a then-club record of £12.5 million to bring the Nigerian, 20, in from Granada in the summer but they are not getting full value for money yet with the limited displays from their big money man owing to injuries. 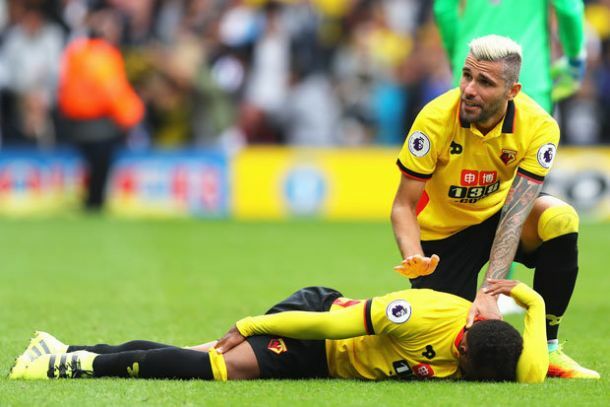 On this latest injury crisis, Boss Walter Mazzarri said he was forced to sub Success last term because the physio wastelling him the Nigerian star was hurting. He said: “I tried to keep him on for as long as possible during the game but after last 90 minutes they looked at him and said he would not train due to muscular problem. “Even in the past I have been saying he has not been training regular because of his muscle problems. He has been having problems in the upper right leg. “He didn’t train all week so he is also a doubt for Saturday’s game at Swansea. He may not be available. It is yet to be seen how quick and fast Success will get back to his very best even as the Super Eagles Technical Adviser Genort Rohr gets set to unveil his list of invites for next month’s 2018 World Cup qualifying match at home to Algeria.